Artworks is a collection of accomplished artists and instructors who concentrate on art appreciation and the process of creation in various art mediums. We offer a variety of classes for all age groups from 3-1/2 years of age to adults and a summer camp for elementary school-age students. Our classes are structured to allow for process-oriented self discovery and class sizes are kept small—with an assistant for each instructor—to ensure individual attention. 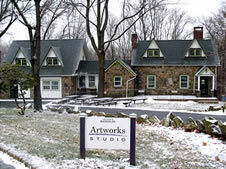 The Artworks Studio is located at 502 Millbrook Avenue in Randolph. This is directly across the street from the Randolph middle school and high school complex and to the right of the municipal building. We are just 1.2 miles south of Route 10 and 1.7 miles north of Sussex Turnpike.